I'm curious to know what experience others have had with online bike purchases. My wife surprised me with a new commuter bike for my birthday several months ago. She bought it from one of the bigger, UK based online retailers that claims "365 day returns." I built the bike from the box and rode it around the block a few times while tweaking saddle height, adjusting brakes, etc. It's a beautiful bike - but it doesn't fit me well and rather than swap out parts, I'd prefer to return it. I've probably ridden the bike a total of 1-2 miles around my neighborhood. There are no scratches, and it's in new/perfect condition. I contacted the retailer to ask about the return process and their response is that because it has been built and ridden outdoors, the bike is "not in saleable condition." So they won't accept the return. My argument is that the bike has been test ridden similar to a test ride you'd take at any bike shop, but is otherwise unused and in new condition. So I'm curious about what others think. Am I wrong in pushing to them to accept the return? This is my only experience with purchasing a new bike online. This may turn out to be an expensive lesson in the value of purchasing from a local shop where you can test ride the bike before buying. From their perspective, I understand that they have no way to inspect the bike and no way to know that it hasn't been damaged or ridden more. But what good is their return policy if customers can't build and test ride new bikes? Do they expect customers to test ride bikes on an indoor trainer?? If you can't get a RMA # from them, you are done. Not to mention if it should get a scratch on the way back, then you got a real shipping cost problem. Do you have the exact box and packing materials it was shipped to you in ? Just a point, if you ship it back in that original box, now used, UPS for example does not honor INS claims on stuff shipped in a used box. Just a thought to toss into the equation. ....rather than swap out parts, I'd prefer to return it. Considering the hassles of disassembling, packing and paying shipping to return it, is the fit so far off that a couple of relatively small parts changes won't make it work? Would say a stem and perhaps a bar change improve the fit enough to make the bike comfortable? Considering the hassles of disassembling, packing and paying shipping to return it, is the fit so far off that a couple of relatively small parts changes won't make it work? I've only bought one bike online. And my expectation was not to return it. I didn't, even though it didn't exactly work out. (handling problem due to odd geometry) The reason I didn't return it was exactly that, the hassle and the shipping cost. I ended up buying a (inexpensive) frame with better geometry. It was my own fault that I didn't understand it better before ordering. There're other items I think "return" is questionable: tires, shoes, chains. Once these items got mounted, they're "used". There's no way I can clean them so they appear in "new" condition. To a lessor degree, cassette and wheels also falls into that same catagory. A quick spin around the block maybe ok, once a brake pad hits the rim a few times, it no longer look "new"! And the chain mark on the cassette appears after only a few miles too. Threadless forks and handlebars too, once the fork is cut, it's obviously "not new", there's no two ways around it! And with handlebar? It took a good while to move everything over, adjusted them and tape it up. I really don't feel like un-doing it again! Anyway, if you really don't want it. You can just lie and say it totally didn't fit and you didn't ride it at all! But you're nonetheless out the shipping cost. What bike did you buy? The fit is not that bad, and I think you're right that swapping the stem and handlebars could go a long way to making it more comfortable. I think the issue is more type of fit/bike than something fixed like a too small seat tube. The bike is built as a retro city bike - and it rides that way, with a very upright, old fashioned 3speed feel to it. In riding around the block and going up a hill, I quickly realized that what I want in a commuter bike is something closer to a traditional road bike but with room for wider tires and the ability to mount fenders and a rack. If I could return the bike, I think I would try to get a Surly LHT or something similar from a local shop. But if return is not an option, I can definitely make some changes to make this bike work. It's a Creme Cycles Cafe Racer Doppio with a 7 speed nexus hub. It's a great looking bike, and I think I can turn it into something that will work fine. I just don't think it's the most practical choice for what I need out of a commuter. My daily commute is short - and this is fine for that. But I'd like something I can use for longer rides as well in addition to pulling a bike trailer loaded with two kids. So in retrospect, I think I need something with a bigger ranger of gears than the Nexus, and I'd like something that fits closer to my regular road bike. I'm not good with measuring angles, but I keep looking at it and wondering how it'd be with drop bars (and of course, some kind of adapter for shifting. I don't know what the range on that rear hub is, of course, but are you thinking you need more high end, more low end, or more range generally? As I said, sweet looking bike. But then, I'm fond of blue (and the matching fenders are very nice). +1 on cool looking, and I like the color too. +2 on the question on range: lower, higher, or wider ? work the chain length for both? The Schlumpf Mountain Drive is the best choice when you are looking for the lowest possible gear ratio. The wide 2.5 reduction ratio can offer an effective chainring size that is lower than any available chainring (depending on physical chainring selection). It also has the highest running efficiency of Schlumpf's offerings, making it the best choice for HPV's or other land-speed vehicles. It is not recommended for use with the Rohloff SPEEDHUB 500/14 due to conflicts with Rohloff's minimum gear ratio requirement. That last line might raise concerns with other IG hubs, like the one on this bike, but with that thing properly set up, you could probably pull a stump. 4/9/13 2:08 PM Radial Laced! Oooh, ooh, I didn't see that the first time. What, are you riding in the Tour de France? After looking at the way the cog is changed [on youtube] it is a 3 slot cog, so my 'imagined' threaded spin on freewheel 2 cog BMX unit is a non go. Radial laced alright but 36 spokes. Obviously not done for weight savings or aerodynamics. ...but it looks so good! Given the obvious WB and CS lengths, there is a big fit window in the middle of this. So fit diddling is broad. Gearing dependent on intended use if i correctly assume one or both of these are the keep issue(s). If gearing is the main desired adjustment, a second wheel with a different cog could be found used reasonable like IMO. Maybe even a combo of a second wheel with a different cog and a double chainring front? This way a wheel swap that gives a larger difference in gear range and one length chain will allow the solution to fly. I know you wrote you want a wider range of gears. But Shimano has pretty complete documentation for this hub and they make replacement cogs in several sizes. I have the same hub, but from a Nashbar Chinese product. 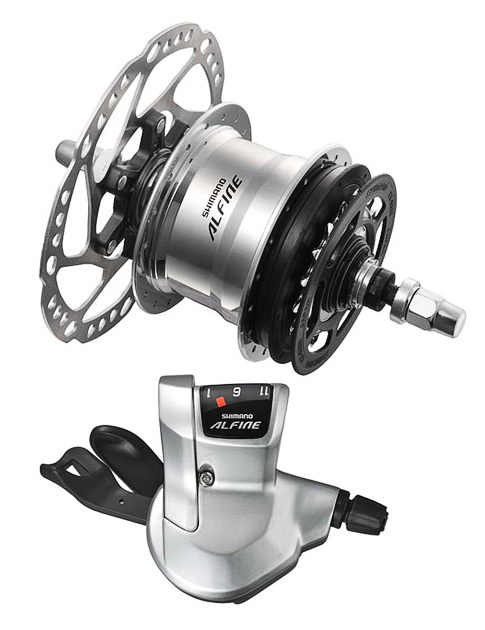 The Shimano docs indicate there are several versions of the hub and they differ internally. I think I have links at home. Add in SRAM 12 with 34/21 cogs give a 30-104GI range. I have no idea if any of these have the option/capacity of a 21 tooth rear cog. Let's talk about the Alfine 11, I did not know that existed until I saw that.. To bad not in the pull down for charting the GI..
You can find the model number on the hub, they all look the same IIRC. Open any promising documentation and examine it. A few of the docs have compatibility indexes even though the name on the cover might not match. So these all need horizontal dropouts, yes? For the key spacer to lock the axel... ? Ideally, I'd like a bigger range of gearing - but to be honest I haven't really ridden the bike enough to say. My main thought was that the low gear was going too be too big a gear for pulling a kid trailer up hills. For most purposes, I think I can make the Nexus work. As for fit, if return is not an option (and it sounds like it isn't), I was thinking of swapping the handlebars for something that gives me longer reach and and more forward (less upright) position. I found a spreadsheet I made last summer that compares the Nexus driven by a 44x20 crank and cog to my road bike 53/39 x 13/32 crank and cog setup. The low gear on the Nexus is closer to a 39x34, so it is geared lower than my drop bar bike. As for the top end it has plenty since I'm not too eager to wind out a 53x13 on a bike that looks a lot like the one in your picture above. Even if I could find a hill steep enough! If there is any lesson to be learned from this it's; "Don't let anyone else buy you a bike if you aren't there to directly supervise the choice." "You don't get what you don't pay for." In this case, personal service including test ride. You'd have to see the details of the return policy to fully analyze this, but on general principles I don't blame the seller on this one.